The Freedom Archives produces curricula for various educational settings. We have created curriculum focusing on resistance to forced sterilizations, on the welfare rights movement and curriculum/activities to pair with our documentary film COINTELPRO 101. This curriculum and resource guide is intended to encourage people to think about the impact of economic and social policy on poor women and children, investigate the causes of poverty and unemployment in the U.S., and reflect on the role of race and gender in shaping who is poor. The curriculum contains audio and print archival materials, interactive activities, and larger discussion ideas and questions. We would like to thank Laura Martin for her significant contributions to this project. This project was conceived and started in 2014 by intern Teeanna Munro as an educational resource to connect forced sterilizations in California’s prisons to historical uses of the practice in Black, Native American, and Puerto Rican communities. The curriculum contains audio and paper archival materials from the Freedom Archives and includes activities that incorporate and develop different skill sets, such as critical thinking, active reading, active listening, and expository or persuasive essay writing, all with the intention of deepening understanding of this recent history and its lessons. We have created this curriculum in order to provide historical context for the issue of forced sterilization, illuminate the voices of those directly affected by forced sterilization, and generate community discussion and activism around women’s liberation and reproductive justice. You can download the free curriculum and resource guide and check out our entire archival collection on forced sterilization here. We would also like to thank Vera Tykulsker and Carli Lowe for their invaluable contributions to this resource. 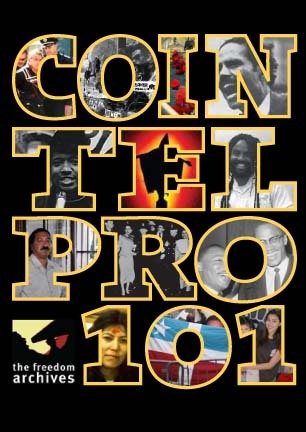 Our initial curricular directions include: some suggestions for discussion immediately following a viewing of the film, entitled “What is Cointelpro” and two interactive class activities originally developed in connection with the case of the SF 8 that are excellent ways to extend learning from the film. These are entitled, “How Far Have We Come?” and “What Would You Do?’ Additionally, our curriculum contains information, activities, and resources on how Cointelpro moved against major civil rights and Black liberation organizations; a research and gallery walk activity on Puerto Rico, with a focus on the nature of colonialism and some of the events and individuals in the history of the Puerto Rican independence movement; a group research lesson on the many Native American events of this time period including occupations at Alcatraz and Wounded Knee; Cointelpro’s impact on the Chican@/Mexican@ Movement; Cointelpro repression against the rising strength of the women’s liberation movement; and suggested essay questions to help stimulate your own questions for writing assignments or class debates.